North Atlantic right whales are an endangered species of large whale that lives off the East Coast of the United States (Kraus et al. 2005). These whales give birth to calves close to shore off the coasts of Georgia and Florida during winter months. Protecting mothers and their calves is critical for the successful recovery of this species and yet nursing mothers and their calves are typically the right whales most often hit and killed by large ships. One way that scientists have tried to reduce the number of right whales hit by ships is to help notify captains when right whales are in an area. Passive acoustics, using acoustic recorders to listen for the sounds made by right whales, has played an increasing role in detecting whether right whales are present in an area (Van Parijs et al. 2009). The sounds produced by North Atlantic right whale mothers and their young calves have not been well described and it is unknown whether they produce the same sounds as other right whales. The goal of this study was to describe the sounds produced by mother-calf pairs in three different critical habitat areas throughout the migration and development of the calf. We collected behavioral data and acoustic recordings of right whale mother calf pairs off the coast of Florida and Georgia in January-March; Cape Cod Bay, Mass. in April; and the Bay of Fundy in August-September from 2011-2014, following calves from birth through weaning (Figure 1). Figure 1. Photographs showing the same right whale mother-calf pair a) in the Southeastern U.S. shortly after birth and b) in the Bay of Fundy, Canada nine months later. All photographs taken under U.S. and Canadian Federal Research Permits. Our data show that mother-calf pairs rarely made sounds in the waters off of Florida or Georgia habitat during the day, and the quality of the sounds produced were less structured than the sounds made by adults. In the other two habitats, in April and August-September, more sounds were recorded, and these sounds showed an increased complexity in the structure of the sounds produced by the calves (Figure 2). Figure 2. 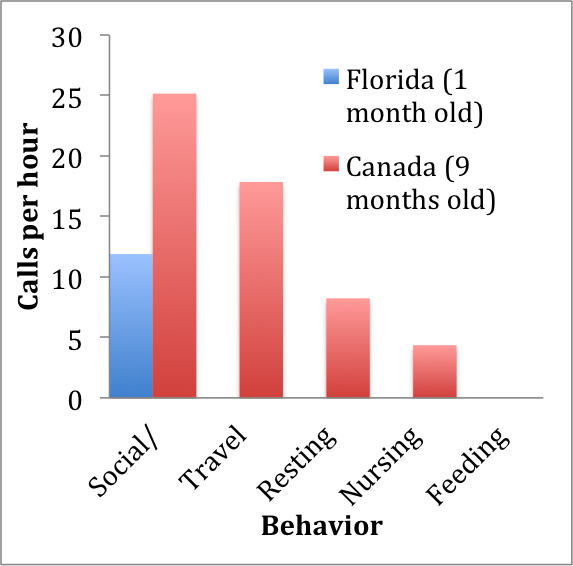 Number of calls per hour detected during behavioral observations of right whale mother-calf pairs in Florida when calves were ~ one month old (blue) and in the Bay of Fundy, Canada (red) when calves were ~ nine months old based on 99 hours of acoustic recordings from 2011-2013. This study indicates that listening for sounds may be of limited use for detecting right whale mother-calf pairs on their Southern calving grounds, while sounds may be more valuable as a mitigation tool in more northern habitats. Understanding differences in behavior and age is essential to detect and protect this vulnerable part of the population. Kraus, Scott D., et al. "North Atlantic right whales in crisis." Science, 5734 (2005): 561. Van Parijs, S. M., Clark, C. W., Sousa-Lima, R. S., Parks, S. E., Rankin, S., Risch, D., & van Opzeeland, I. (2009). Management and research applications of real-time and archival passive acoustic sensors over varying temporal and spatial scales. Marine Ecology Progress Series, 395, 21-36.